In the context of cosmology, structure formation refers to the process by which cosmological structures such as galaxy clusters form under gravitational collapse of a primordial gas. 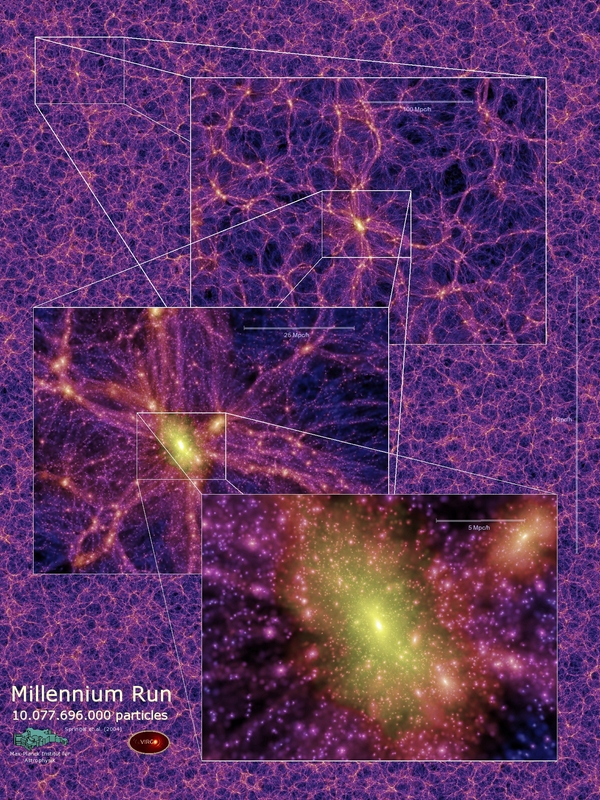 Various computer simulations (Millenium I, Millenium II, Millenium XXL, Illustris) test theory against observations, such as those by the Planck Collaboration, see Springel 13 for survey. The simulation reproduces reasonably well the cosmic star formation rate density, the galaxy luminosity function, and baryon conversion efficiency at z=0z=0. It also qualitatively captures the impact of galaxy environment on the red fractions of galaxies. The internal velocity structure of selected well-resolved disk galaxies obeys the stellar and baryonic Tully-Fisher relation together with flat circular velocity curves. In the well-resolved regime the simulation reproduces the observed mix of early-type and late-type galaxies. See also Illustris Project Website: What are we learning? and Preliminary Results. Last revised on April 8, 2019 at 10:26:57. See the history of this page for a list of all contributions to it.